This informational data outlines the process, and the recycling equipment needed to process 50mm, or 2 inch tire derived fuel chips, into a 12mm or ½” wire free rubber granule mix. We have outlined the first stage of a recycling system, being the shredding stage. Now we will proceed to further our discussions about the second stage in a tire recycling system, that being the Rasper stage. The picture above shows baled tires being received for recycling at a tire plant. As we have noted, for many years tire recycling involved basic shredding of tires for legal disposal of the waste material into a landfill or for energy via burning. 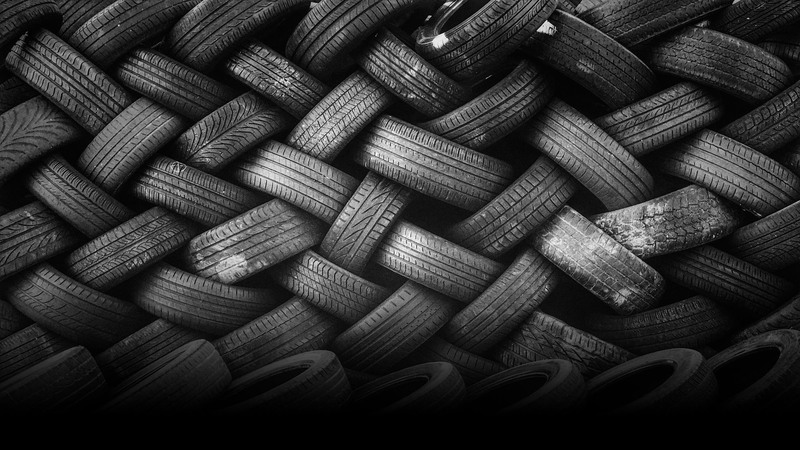 Over the last 45 years tire recycling has evolved from basic disposal through a fuel preparation stage to a full recycling stage today. There are even more changes, as the value of the steel or metal contained in a tire has turned into a major income stream of significant bottom line value for tire recycling. Because of this change, there is a new and growing demand to remove the steel from the tire, in order to increase bottom line revenue for a tire recycling plant. Basically, this steel removal stage is called the Rasper stage and involves a Rasper system. The overall result of a Rasper system is to remove the steel from the rubber. Resulting in two fractions, a steel fraction and a rubber fraction. You cannot remove the wire or metal from a tire unless you process the tire in a shredder stage. Once the tire is prepared for the proper size, it can enter into the Rasper stage. As outlined in prior data, you have to size a tire properly into a TDF form using a “slice and dice” shredding process. By shredding a whole tire, three or four times, in different directions, you make the tire derived fuel feedstock for a Rasper, or for the Rasper system. The Eidal Rasper system uses our special rotor design, which is bi-directional for reduced wear. There are several designs of this Rasper concept. There are also several names for these type of machines. The most common name is “Rasper” but there are also other derivations used in the industry, correct or not, such as a Grizzly, granulator, or Knife Hog. Our “Eidal Rasper” is designed to process a rough tire shred, or if possible, a 50mm tire chip, and physically rip the steel out of the rubber, by a mechanical rip and tear design of the rotor or cutting head. What exits the machine is a mix of 12mm wire free rubber granules and basically rubber free clean tire wire. In the industry, clean tire wire normally means 98% rubber free. However, depending on the design of the system and the needs of the customer or end users of the rubber and steel, you can change the design of the Rasper system to allow for different grades of rubber and steel. One such change is to use a primary Rasper and a secondary Rasper in the Rasper system design. The larger the screen size in the Rasper, the less wear encountered by the Rasper. The larger the screen size used in the Rasper, the less clean the steel will be of attached rubber. However, in most cases a Rasper can easily produce a wire free rubber granule, and a wire that is 95% rubber free. This picture shows the various sizes of tire wire that are removed from a tire during the Rasper stage. The important factor in a Rasper system design is the need for clean wire free rubber and clean rubber free wire. As you can see in the screen data, there is no universal screen size that makes clean rubber and clean steel. Clean rubber free of steel is easy to make, clean steel free of rubber is not easy to make. There is a compromise in a Rasper system where the design must allow for the production of wire free rubber granules takes a priority over clean steel or tire wire. Further processing of the steel or tire wire after the Rasper in a wire cleaning system is often necessary to ensure a low wear cost in the Rasper and a high return value in the tire wire. Baling or briquetting of the tire wire is also a consideration that must be made in the system design to determine the proper required density of the metal for shipment and smelting to maximize the its value for the recycling venture. Very clean tire wire commands up to 50% more value than lower grade tire wire contaminated with rubber. High density baling or briquetting of tire wire also commands up to 50% more value than loose material. Therefore in the Rasper design you often must include a wire cleaning system and a wire baling system. The basic design of a Rasper system includes a magnetic separation and often a screening system. This picture above shows the discharge magnetic system and screening system attached to the Rasper system. This is another view of a Rasper system with a magnetic removal design and an auger feed system to move the granule mix into a truck for transport. The best design for a Rasper is to take the wire free rubber granule and screen for different sizes. This is a typical layout of an Eidal Rasper with a magnetic removal system for the tire wire and a double deck screening system to separate the rubber fraction from the Rasper. The important design features of the Eidal Rasper is the tool steel inserts that reduce the maintenance intervals of the machinery and lower the cost per ton of production. The main rotor assembly is typically driven with a 400 hp drive motor. The main rotor turns at about 100 rpm. This is a typical Rasper layout for a tire recycling plant or even a wire recycling reclaim plant. The design is simple and robust and is an addition to typical tire shredding operations that produce only TDF or tire derived fuel. The design of the Eidal Rasper system can also be used for wood pallet grinding where metal is removed from the wood fraction and screened for recycling and mulch. The design of the Eidal Rasper system can also be used for wire and cable processing to reclaim copper and aluminum from waste wire and cables. The design of the Eidal Rasper system can also be used for WEEE or electronic waste recycling and computer recycling to help extract valuable materials from the waste stream. This picture shows a single Eidal industrial shredder and a single Eidal Rasper design with a simple infeed conveyor and magnetic removal design. There are small versions of our Eidal Rasper and large versions of the machine. The smaller version is often called the Eidal nibbler Rasper. Mini systems or entry level system using the Eidal Rasper or the Eidal nibbler Rasper can help many recycling groups enter into a wide range of recycling applications.